I debated making a onesy post for two very distinctly different restaurants in Seattle, but I do so because a. it’s my blog and b. because it is a testament yet again to how wonderful the food scene is in Seattle. So granted you can in theory eat diversely in Italy, it is for sure not as abundant as what I am seeing in my larger “hometown” of Seattle. And this is what I am rediscovering in my time back. Let’s get to business. 1st up I have: Shanik. An Indian restaurant in South Lake Union (Seattle) which whips up fine, modern Indian food and is directed by the chef Meeru Dhalwala who gained initial fame and a loyal following from her Vancouver based restaurant Vij’s. My curiosity was first tickled after reading The Stranger’s write up which spoke of cricket paratha (a sort of flatbread). I am a curious eater so I just had to see this place for myself. I then cross referenced yelp for reviews and found that some yelpers had some unsettling chicken korma with the quality of dishes in proportion to the pricing. I took the plunge regardless to see for myself, after all- yelpers can be whiny and untrained critics at best. A restaurant has to make money. It costs a lot to run a restaurant in American cities like Seattle. I struggle with this statement as I have a hard time swallowing the exclusivity of restaurant dining. But you know, it’s just the way it is. Italy is a cheap place to eat because the economics of food is just different. Most great places are family fun for decades and their overhead is simply lower. At Shanik, we were sat by the kitchen. Some people despise this but I do not. I want to see who is making my food. I am not some snob who thinks I am above being near the kitchen. I am curious to catch the behind the scene glances and the occasional whiffs of what they are whipping up which enhances my tasting experience. After all, your taste buds are only as good as your sense of smell. At the table there were rounds of calculated rotated dishes of smoky, gamey ground lamb kebabs with a creamy fennel seed curry and a side of sprouted mung beans for health sake which served to compliment the meaty, lusty kebab’ery. The quirky cricket paranta that had serious kicky spice with a chunky chutney that served as a texture buffer with a Pacific Northwest topping of sauteed cabbage and kale. Mains included a very flavorful spinach sag and housemade paneer cheese curd goodness with no mercy spicy turmeric rich dal lentils on the side. What was really the home run was the grilled venison medallions with a date and tamarind puree which provided that dolcastro sweet/salty/savory tart flavor fusion on the palate that left a pleasant unending flavorful finish on the palate. Intermittently cleaning the palate with a soft Pilsner which renewed my buds for the experience over and over. I disagree with disgruntled yelpers. I am glad there are sites like yelp which provide a second opinion from critics and the staff praises, but they must be taken with a grain of salt. Most of these people quite frankly don’t know what the hell they are talking about. The service was swift, sincere and unobtrusive. Intuitive and courteous. They did not interrupt in my tasting parade 3 minutes in with my mouth full nor did they obsessively refill my water glass every 4 sips. The barman even was kind enough to sample us on a few beers and a cider before able to choose the one that was just right. In other words, the curious approves. Next on the docket is Restaurant Roux in Fremont (Seattle). The chef behind this soulful kitchen is the mastermind behind the food truck Where Ya at Matt. Aside from being a handsome sight to behold with style, Matt has not ceased to impress me with his creative twists on Southern inspired food and has wooed me again with his French inspired Creole joint in the once great watering hole “The Buckaroo.” In case you didn’t already know, I spent 7 years living in the south and hush puppies and fried chicken livers were apart of my mother’s dinner menu rotation as a teen growing up. I was pretty spoiled by my mother’s cooking as she formed my palate and appreciation for gastronomic identity and place. What I loved about this place is we spent hours here and did not feel like we overstayed our welcome. Matt is great because of his presence, the restaurant is filled with some soul. It is rare to find the chef of a restaurant in Seattle actually in the front of house, being a social counterpart to the experience greeting and meeting diners as they savor through. That is what I find missing in the fine eating scene in Seattle: soul and warmth. This is why, albeit inconsistent in quality, I love eating at mom and pop hole in the walls in Italy. We started at the bar with cheap tallboy beers and jalapeno cheddar hushpuppies. This is another 10 points for Matt in my book- he has a little something for everyone and not just 8 dollar pretentious beers. You can easily experience Roux without burning a massive hole in your wallet. 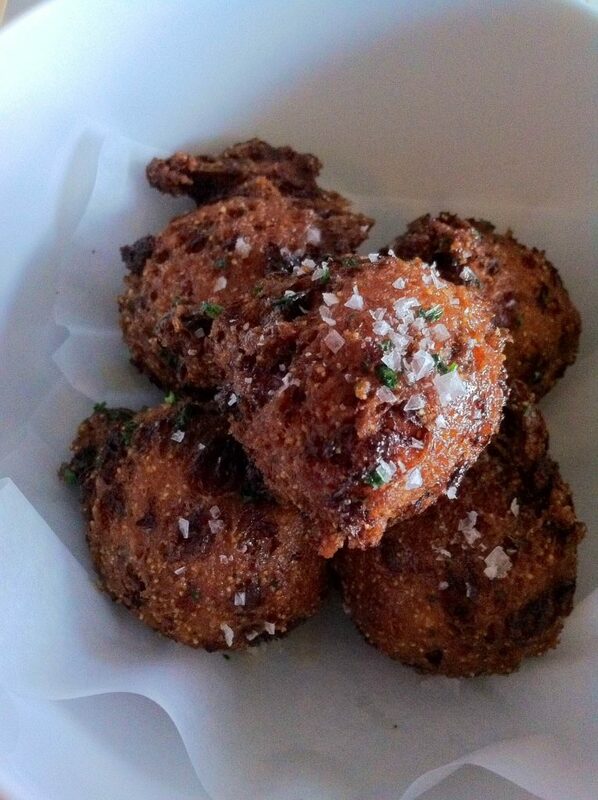 Sweet and salty hushpuppies fried to crispy, moist heavenly heights. The hushpuppies were a great mix of spice, corny carb, sharp cheddar, sweet and salt as they were drizzled with a smidgen of honey, touched with lemon and specked with flaked sea salt. After we had leisurely enjoyed our bar snacks and tallboys, we were whisked over to a table for dinnertime. Roux has an open area where the plate staging and sous chef prep takes place and I love it. Next time I am in, I will definitely have to sit at this side of the bar. I was lucky enough to get to grill the sous chef on his picks and he said “you gotta have the pigtail. period.” So pigtail it was. I do not shy away from foods of the offal sort. In fact, one of my favorite foods in Florence is lampredotto (basically cow guts). The pig tail was subtly smothered in a Korean inspired sauce and speckled with kimchi a top. The tail smacked me in the face with crisp, fat and fall off the bone melt on your fork meatiness. Please take note this is not for the faint of fat. This tail was a episode of crispy layered fat. 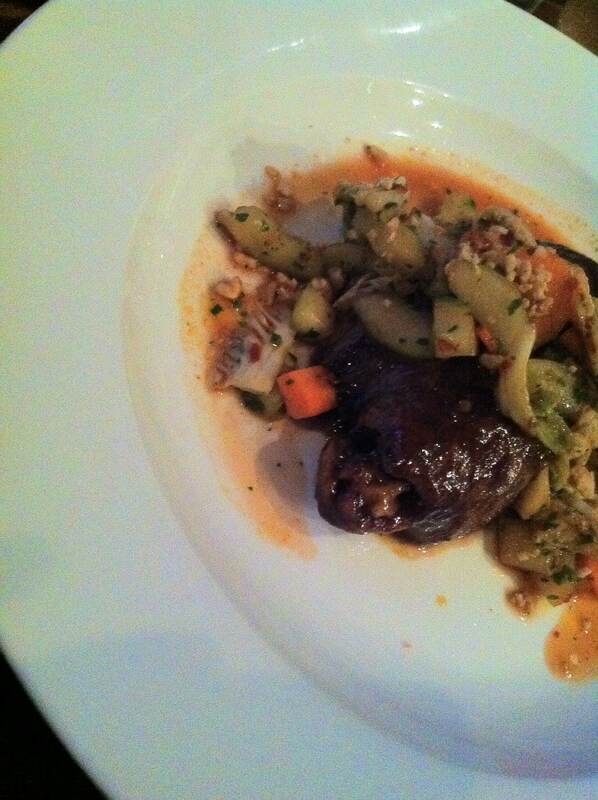 Smack your taste buds with pig tail at Roux. Sous chef’s pick. Worth noting was a starter portion of fried chicken livers and gizzards with a silky, creamy spicy mayo-like sauce which brought me back to my fried organ eating days in Memphis. The batter was flavored and spiced quite nicely, not over fried nor overly overwhelming as offal can do. Other noteworthy dishes at the table was an explosively delicious Shrimp and Grits (which I will order next time even if the shrimp do come from the Gulf) and Fried Chicken and Rice which sounds boring but was totally juicy, breaded to the perfect crumb and juicily fried. My only ONLY critique (which I should give otherwise my readers might think I’ve gone all buttery and nice) is that there was a tad much salt in just about everything. Which was a shame since the food was beautifully spiced and balanced otherwise, it was as if someone in the kitchen made a masterpiece without the crutches of salt but didn’t have quite the confidence to make the plunge without jumping in a little more naked. But maybe they had a salt spill in the kitchen or I am not used to the American standard of salting anymore. So I will leave you, my dear readers with a sweet closing. My jaw dropped at the sight of the red velvet cakes on the staging platform of the open kitchen bar, but my heart dropped more at the sheer delight of nibbling (devouring) this banana cream pie with a cream delicately touched with peanut butter and a micropinch of salt. Perhaps this is where the careful salting energy was focused because it definitely had the exact precision of sweet and salty euphoria. 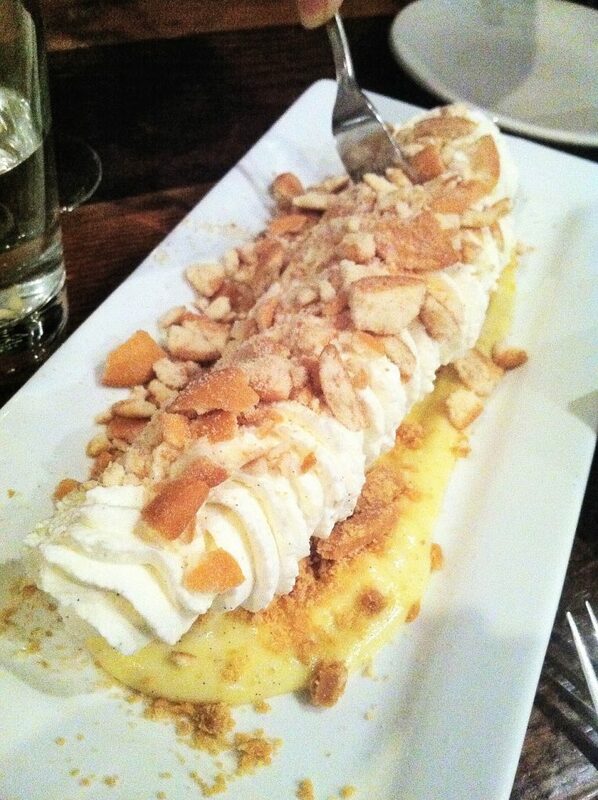 Diabetes, I’m coming for you with this Banana Cream Pie. p.s. Looking for more tips for eating in Seattle? In addition to updates about Italy and random deep thoughts, I throw in the occasional Seattle restaurant alert on my facebook page and eating scenes on my instagram feed. Cheers! I am not of the faint of fat variety and I assure you I’ve been successfully convinced that I’ll have to sample this pig tail at Roux. Its refreshing to find someone who is not so overly calorie conscientious it keeps you from relishing some of the true delights in food, fat is food after all and theres a reason we’re drawn to it. Your curiosity is genuine and I love to see that it’s not shaken by the prospect of dining on offal. As always, a delight to review your reviews.